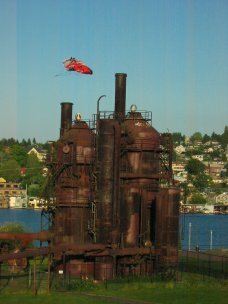 Is Gasworks Park the strangest park you've ever been to? 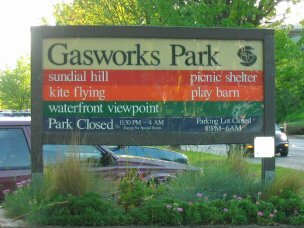 Gasworks park is one of the coolest parks we've ever been to and definitely one that we keep going back to every time we visit Seattle. What makes the park so unusual is that it sits on the the site of a former gasification plant (a place to manufacture gas from coal). In the 1950's, natural gas began to be imported, thus making the plant obsolete. 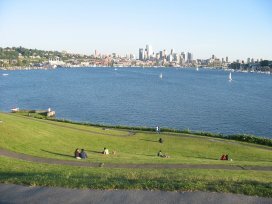 The city of Seattle bought the 20-acre park in 1962 and it was then opened to the public in 1975. Part of the gasification plant, while still at the park, is closed off to the public, but part of the structure, such as the boiler house, has been converted to a picnic area with tables and barbecues. There is also a maze of brigtly-colored painted machinery which has been converted from the old exhauster-compressor building where the kids can play around. There is a big grass mound in the middle of the park that makes a great area for flying a kite. 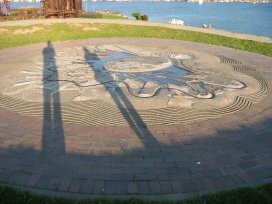 On top of the mound is a human sundial which is pretty cool and the view of Lake Union from the top is simply unbelievable. You can sometimes see planes take off and land from the lake. While we've been to the park more than a few times, there is one thing that our kids don't like about it. Our kids don't enjoy the park as much as others because there are no playground areas like other parks have. There is a lot of open areas where you can play soccer or volleyball or just run around, though. The park is open from 4 AM - 1130 PM and is located south of Wallingford at 2101 N Northlake Way. And when you're done checking out Gasworks Park and need something to eat, you might as go get something to eat in Seattle.